High-speed rail would be California’s most expensive mode of intercity transportation. 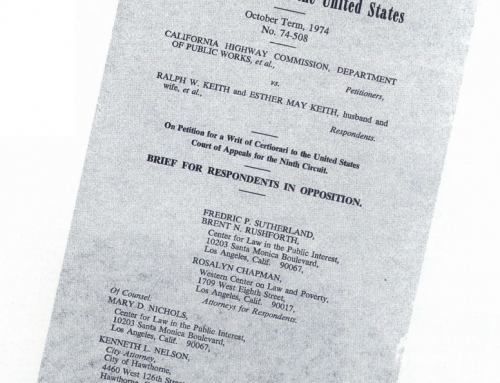 In 1993, the state of California formed the California Intercity High-Speed Rail Commission to develop a twenty-year plan for service along the California Corridor, from Los Angeles to San Francisco. A high-speed rail system would cost $10 billion to $15 billion, but its advocates believe it would be the least costly mode of intercity travel in California. They emphasize that trains can travel between northern and southern California in under three hours, while consuming less energy and generating less pollution than automobiles or airplanes. Further, they contend that a cost analysis cannot be limited to out-of-pocket costs because air and highway transportation benefit from various hidden subsidies and generate external costs, such as pollution, that are borne by nonusers. In an effort to appraise the comparative costs of competing rail, air, and highway systems, my colleagues and I conducted a detailed study that I summarize here. We have attempted to build upon several recent studies that estimate the full cost of transportation – not a simple accounting task because it’s easy to fall into the trap of double counting or of missing a cost category. Accounting difficulties arise because there are several shared costs. For example, travelers ride in vehicles (cars, planes, trains) that use infrastructure (roads, airports, tracks) . One cannot simply add up the costs for each component. There are transfers between components, such as gas taxes used to fund infrastructure, and these transfers must be excluded from the final tally. Other problems arise when establishing transportation system boundaries. Automobiles typically burn gasoline and create pollution, which usually get charged to the car’s account. A high-speed train uses electricity, creating pollution at the power plant. Should this pollution be ascribed to rail travel? Or should we say that the electricity sector is responsible for mitigating its own pollution and that those mitigation costs should be reflected in higher electricity costs borne by the railroad? Our research takes the latter approach of separating cost centers. Travel costs depend on the number of people traveling. The more people sharing a fixed cost, the lower the per-passenger cost. On the other hand, the more people using a road, railroad, or airport, the greater the delay. Therefore properly measuring costs requires knowing how costs vary with use. In this study, we divide costs into several main categories: infrastructure, carrier, user monetary, time, noise, accident, and air pollution and global climate change. Some of these costs are internal to the transportation system, that is, they are borne by the riders, carriers, and infrastructure owners. Others are external, that is, they are borne by persons other than riders, carriers, infrastructure owners. We use estimates based on travel along the California Corridor. Infrastructure costs result from constructing and operating airports, highways, and tracks. They also include the costs of mitigating water pollution and other environmental damage when mitigation is integral in construction. The air-travel system generates airway infrastructure, such as air traffic control provided by the Federal Aviation Administration, and airport infrastructure, including both terminals and airside facilities, such as runways and taxiways. Highway infrastructure costs include not only pavement and land, but also the cost of maintenance, administration, law enforcement, and interest on debt. High-speed rail does not presently exist in California, so we rely on engineering estimates of land, construction, and maintenance costs. Air-system infrastructure costs at the airport reflect economies associated with passenger loading – the more users, the lower the cost per passenger. However, highway infrastructure costs show slight diseconomies: the cost of building and operating the system rises with additional users. High-speed rail is expected to be like the air system, particularly since its capacity greatly exceeds its use. Overall, in the California corridor, a high-speed rail system will have higher infrastructure costs per passenger-kilometer compared with air and highway. If the high-speed rail system were in a more heavily traveled corridor, there would be a trade-off between higher capital costs due to higher land and construction costs, and more passengers to share those costs. How that trade-off is resolved depends on site-specific conditions. The high cost of high-speed rail infrastructure comes as no surprise. The tracks serve only one corridor for one type of trip (intercity) and are usually underused, while airports serve many corridors for both short- and long-distance intercity trips. Roads similarly operate over many transportation markets and serve local travel as well. Rail infrastructure is the least flexible among the three modes with its tracks standing idle most of the time. Carrier costs are those that an airline incurs in owning and flying an airplane (or that a railroad incurs in owning and running a train) minus the taxes and fees they pay to use infrastructure. On highways, bus travel comprises carrier costs, but the vast majority of Californians travel by automobile. Thus we consider highway costs separately as user monetary costs, and bus costs are not calculated. User monetary costs include all expenses users pay to ride the plane or train and all expenses they pay to own and operate their own vehicle, such as gas and vehicle ownership taxes. All vehicles (planes, trains, and cars) show economies of capacity utilization. It is more cost-effective when there are greater numbers of passengers riding in the same number of vehicles. Similarly, it is more cost-effective to operate a vehicle more intensively over time than to purchase additional vehicles. This means that an auto owner who drives his car 30,000 kilometers a year has lower per trip costs than one who drives 15,000 kilometers per year. The depreciation in the car with the extra distance is negligible compared with the decline in a car’s value over time, simply due to changing technological and stylistic preferences. 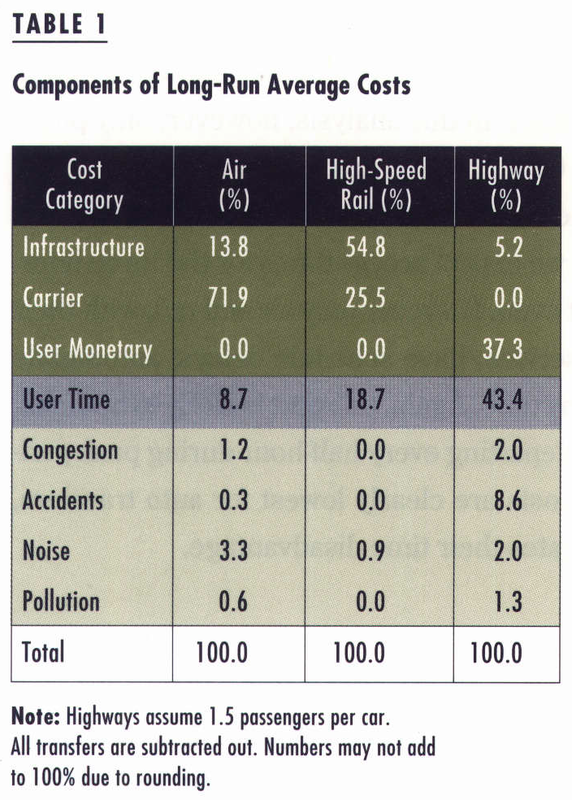 Comparing the three modes, the expected carrier costs for high-speed rail are slightly lower than the user monetary costs for cars, while the air system has the highest carrier costs. This is not surprising given the energy requirements to keep a plane airborne and the high cost of aircraft relative to trains and mass-produced autos. Take note of an interesting trade-off between infrastructure and carrier costs: High-speed rail has very high infrastructure costs, but relatively low carrier costs. In contrast, air travel has low infrastructure costs, but higher carrier costs. Investment decisions are thus very sensitive to the time-value of money. Long-term investments with low interest rates, such as sinking scarce capital into the land required to support high-speed rail, make more sense than those at high rates, when decisions need faster payback. When choosing a travel mode, people consider how much time it takes to get to places via each mode. Unless they are charged for delays they impose on other travelers, they do not consider those time losses. Delays afflict both the air and highway modes. Congestion pricing, which charges users a fee based on the dollar-equivalent of the delay they impose on others, might redistribute time costs equitably but it awaits a large-scale test. Despite congestion, air is the fastest mode, followed by highspeed rail and automobiles. In this analysis, however, only point-to-point time matters. Other related costs such as access times, schedule delay, and the costs of renting a car at a final destination are excluded. Overall, we expect access times for the three intercity modes to be about even. However only air and rail, with their limited frequency of service, have schedule delays; automobile drivers can depart at any time. Again, this cost is likely to be small, with flights and trains departing every half-hour during peak periods. These excluded costs are clearly lowest for auto travelers, which somewhat mitigates their time disadvantage. 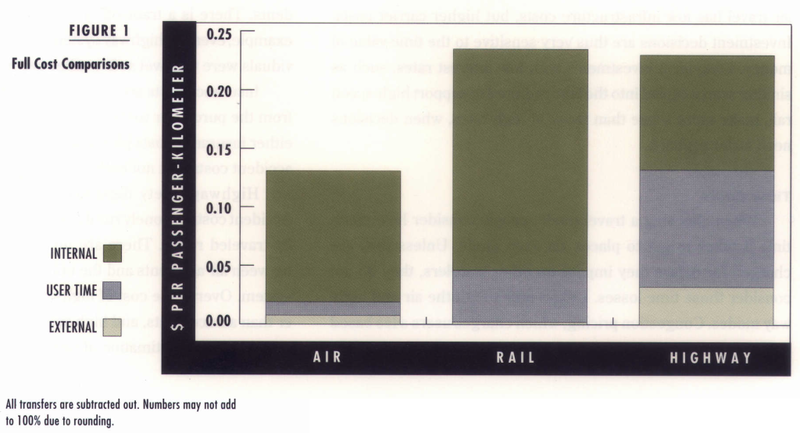 Cars, trains, and planes all generate noise, causing reduced property values near roads, tracks, and airports. Recent technological improvements have produced quieter vehicles, particularly planes, but the noise externality remains significant. One should note that noise levels flatten out as the number of sources increases; so two vehicles produce less than twice the noise effect of one vehicle. Further, as with other costs, the total cost of noise will rise with use, but the cost per unit will decline. High-speed rail systems are designed to reduce the possibility of accidents. Routes are entirely grade-separated and have other built-in safety features. The safety costs are thus capitalized in higher construction costs, rather than being realized in accidents. There is a trade-off between safety and other costs. For example, even the highway system would be extremely safe if individuals were to travel at five miles per hour. Insurance costs are simply transferring the risk of accidents from the purchaser to the insurance company. So one can count either insurance costs plus uninsured accident costs, or count all accident costs, but not both. Highway safety depends on the volume of traffic flow. Accident costs on lonely rural roads are higher than on more heavily traveled roads. There are no well-understood relationships between air accidents and the utilization of the air transportation system. Overall the cost of highway accidents is fifty times larger than air accidents, and high-speed rail accidents are too infrequent to permit estimation of rates. Unlike cars and planes, high-speed rail avoids the pollution externality because the electricity that powers trains is considered outside the transportation sector. In an efficient economy, pollution costs would be internalized in the cost of electricity through government air-pollution regulation. Here, we assume that these costs are internalized, and we ascribe to high-speed rail electricity costs above current market conditions. Cars and planes bum fuel, which generate pollution and contribute to global climate change. Automobiles generate at least three times as much pollution as do airplanes. Pollution generated by cars and planes has been reduced over time as vehicles become better regulated and more fuel efficient. Still, particulate matter, hydrocarbons, and oxides of sulfur, carbon, and nitrogen have measurable negative health effects. The severity of health effects depends on how many people are affected, as well as on local climate and geography. For instance, a gram of pollution in Los Angeles has greater health and economic effects than the same amount of pollution in San Francisco. There is considerable controversy over the extent of economic damages that global climate change, the “greenhouse effect,” may cause. The problem of changing temperature patterns took decades to emerge and will take decades to resolve. The solution most widely suggested is a tax on carbon emissions that is at least proportionate to the damage. There is over a forty-fold range among the serious proposals for carbon taxes; in this study, we use an amount lower than those advocated by some environmental organizations. Pollution and global change costs from automobiles are about four times more than those from airplanes. This is mainly because cars typically have less efficient operations and more stops, starts, and changes in speed. Further, the fuels used for each mode have different combustion properties. We have excluded several related costs because they are outside the strictly defined intercity transportation sector. In order to evaluate costs, borders must be drawn around the system being considered, otherwise an evaluation of the entire economy would be warranted. For example, some researchers ascribe a fraction of US defense costs to the transportation sector, since much of our defense spending protects the Middle East, an oil-producing region that would not otherwise be defended. We find this link tenuous and consider defense costs outside the transportation market. It is unclear whether such expenditures actually lower energy costs and may be undertaken for other geopolitical reasons. Others consider parking as a cost associated with transportation. Parking is not free – it is either charged directly to the motorist or subsidized by the provider (for example, a shopping center, an office building, or a developer that builds streets wider than necessary). We don’t consider parking costs since this research is limited to assessing intercity transportation, and parking is a local cost that is unlikely to be avoided by switching intercity travel modes. 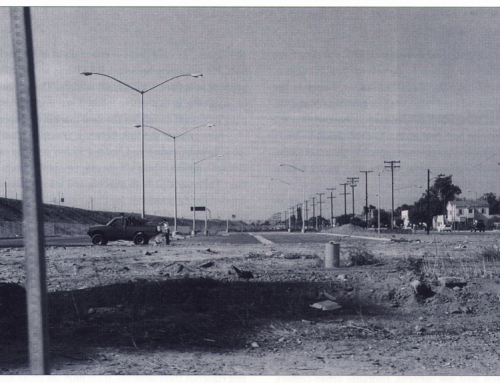 Urban sprawl and the increased cost of serving dispersed land uses are sometimes attributed to automobiles. 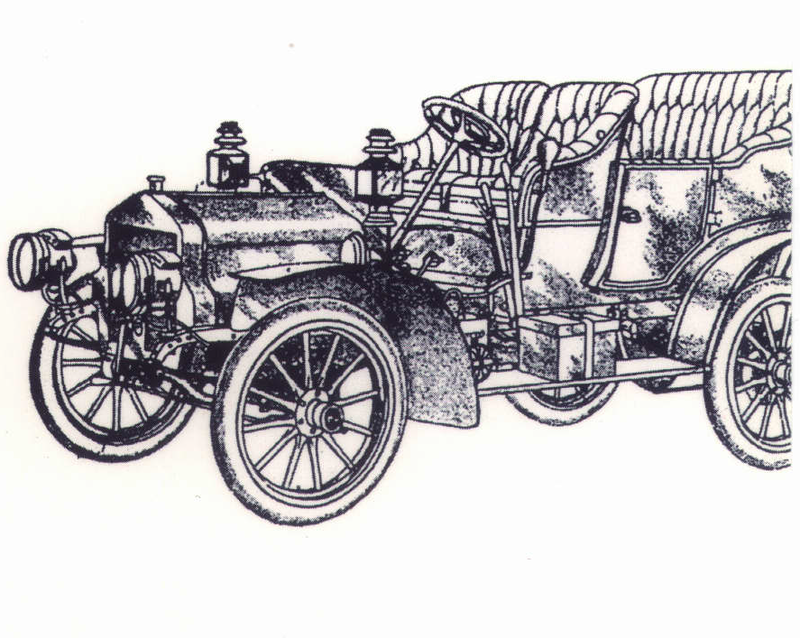 Certainly automobility enables dispersed housing, but so do the telephone, fax, and other technologies. It is at least a second-order effect and outside the intercity transportation sector. There are also costs that have long been recognized but are seemingly impossible to quantify accurately, such as “social severance” (the cost of dividing communities with infrastructure) or “ecosystem severance” (the environmental cost from placing a highway amidst native ecologies). Figure 1 shows the internal, external, and user time costs for the three modes. For intercity travel with trip lengths and levels of demand similar to those in the Los Angeles-San Francisco market, air travel has the lowest full cost, while high-speed rail and highway are about the same. This suggests that high-speed rail is unlikely to become a substitute for air travel. Over shorter distances, high-speed rail has a chance to compete if other market conditions fall into place. 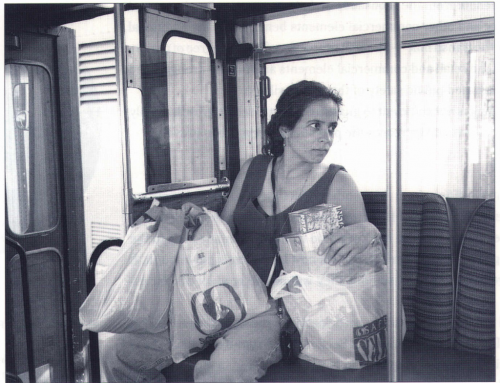 However, like urban mass transit systems, the conditions are very specific. They require poor level-of-service on highways or high levels of point-to-point travel demand over distances shorter than those practically served by air. Considering all relevant costs, high-speed rail would be California’s most expensive mode of intercity transportation. IBI Group, “Full Cost Transportation Pricing Study: Final Report to Transportation and Climate Change Collaborative,” 1995. INFRAS/ IWW, “External Effects of Transport. International Union of Railways,” Karlsruhe University, 1995. T.E. 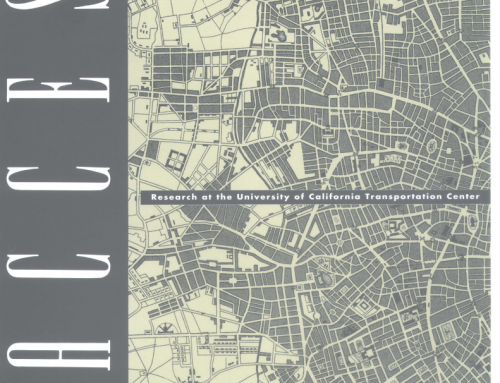 Keeler, L.A. Merewitz, and P. Fisher, “Full Costs of Urban Transport” (Berkeley: Institute of Urban and Regional Development, University of California, 1975). 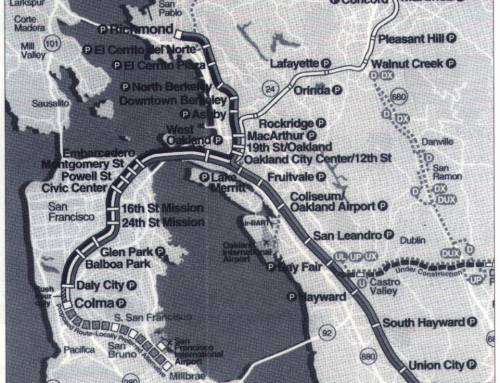 Daniel Leavitt, Peter Cheng, Erin Vaca, and Peter Hall, “Potential for Improved Intercity Passenger Rail Service in California: Study of Corridors,” (Berkeley: Institute of Urban and Regional Development, Working Paper 612, 1994). Daniel Leavitt, Peter Hall and Erin Vaca, “Revenue and Ridership Potential for a High-Speed Rail Service in the San Francisco/Sacramento-Los Angeles Corridor,” (Berkeley: Institute of Urban and Regional Development, Working Paper 609, 1994). Daniel Leavitt, Erin Vaca, and Peter Hall, “High-Speed Trains for California; Strategic Choice: Comparison of Technology and Choice of Route,” (Berkeley: Institute of Urban and Regional Development, Working Paper 564, 1992). 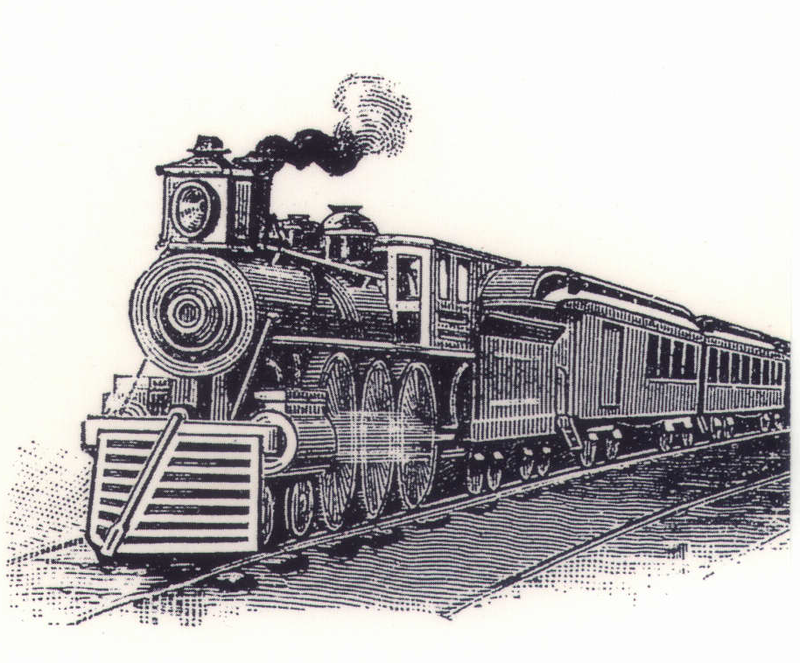 Daniel Leavitt, Peter Hall, and Erin Vaca, “High-Speed Trains For California; Volume II: Detailed Segment Descriptions, Cost Estimates, and Travel Times Calculation,” (Berkeley: Institute of Urban and Regional Development, Working Paper 565, 1992). David Levinson, David Gillen, Adib Kanafani, and Jean-Michel Mathieu, “The Full Cost of Intercity Transportation: A Comparison of High Speed Rail, Air and Highway Transportation In California,” ITS Research Report, UCB-ITS·RR-96-3 (1996). James Mackenzie, Roger C. Dower, Donald D.T. Chen, The Going Rate: What It Really Costs to Drive (Washington, DC: World Resources Institute, 1992). Peter Miller and John Moffet, “The Price of Mobility: Uncovering the Hidden Costs of Transportation,” National Resources Defense Council,San Francisco, October 1993. Emile Quinet, “The Social Cost of Land Transport,” OECD Environment Monograph No. 32 (Paris: OECD, 1990).